Crouse-Hinds Arktite® Style 1 polarized pin and sleeve receptacle assembly has voltage rating of 600-Volt AC at 3-Phase/250-Volt DC and current rating of 100-Amps. With pressure and crimp/solder termination, this receptacle assembly accommodates up to 4 - 1-AWG/2 - 1-AWG building and 4 - 2-AWG/2 - 2-AWG extra flex conductors. The leaded red brass heavy-duty receptacle assembly features cast aluminum construction with natural finish. 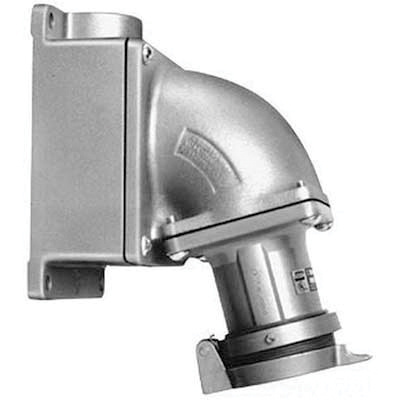 Receptacle offers resistance to dust, dirt, moisture, corrosion and Water. This 4-Pole 4-Wire assembly features extra wide electrical spacing allows for maximum safety. It withstands rough usage and the effects of adverse environments. It is perfect for supplying power to portable electrically operated devices such as motor generator sets, compressors, heating/cooling units, welders, conveyors, lighting systems and similar equipment. Receptacle assembly is UL listed and CSA/CE/IEC certified.